Nearly 3000 job seekers, from school leavers to seniors, visited the expo with 80 displays from dozens of employers, training groups and recruiters. It was the fourth in Brand since 2009. More than 800 jobs were advertised at the expo with the ‘jobs and skills board’ one of the most visited areas. One of those to visited the board was Ben Sharp (19), from Baldivis, who has a job but wants to start an electrical apprenticeship. ‘I came down to have a look around and I’ve got plenty of information and jobs from the wall,’ he said. Mr Sharp said he had spoken with several businesses, including the Chevron Wheatstone stall that proved one of the biggest drawcards. Several hundred people visited the stall, both skilled and unskilled job seekers. The WA Chamber of Commerce, Serco and Town of Kwinana also had displays. 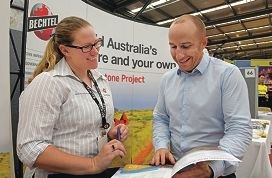 Minister for Employment Participation Kate Ellis said it was evident with the number of young job seekers at the expo that youth unemployment was a regional problem, but expos helped connect job seekers with employers and trainers. ‘You can see looking at the number of young people coming through the door today, the number of people who come from jobless families, we need to make sure we have programs in place addressing them and that we look beyond the headline statistics in WA and see the real stories in WA,’ she said. Many saw WA as a state with great wealth, huge prosperity and very low jobless, she said, but many still struggled to find work. Mr Gray said 10,000 people visited four expos in Brand with about 1000 finding jobs.